Some commands in the Cisco router configuration are just irreplaceable. The ‘show’ commands are the most widely used in Cisco routers. Here is a list of the 10 mostly used of these ‘show’ commands. This command is your true best friend. It shows the complete configuration that is running currently. Using it you can troubleshoot almost all issues regarding routing, filtering, secure access, and many other issues. Using it before you start configuring the router would give you a clear idea of what services and protocols are operating by default and which are turned off by default. This command shows the configuration that is saved on the NVRAM. 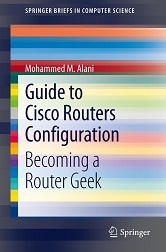 It is helpful in knowing the configuration that will be applied the next time the routers is reloaded. And also this command is useful in knowing the configuration that was loaded at the start-up of the router before making changes to it. This command shows status and statistics regarding interfaces. This command is almost always needed in troubleshooting routing and link issues. Things that are shown using this command include, interface IP address and subnet mask, interface status, encapsulation type, bandwidth, and many other important indicator about the interface operation. This command shows the routing table. This table helps you in finding out the next hop for each and every routable packet. It is the first indicator to point a problem in routing. This command shows the routing protocols used in the router and what networks are these protocols advertising. It also shows the sources of routing updates received at this router. It is very useful in routing issues troubleshooting. May I know about a packet tracer Network diagram where we use all the routing and switching protocols completely, arranged network like original live network. We looking forward your reply.